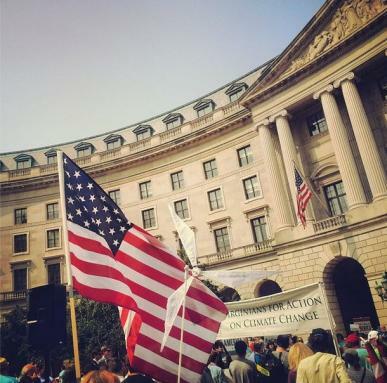 Image of the DC rally outside the EPA hearings. Photo by Heather Shelby. Across the country this week, the U.S. Environmental Protection Agency (EPA) held public hearings to solicit comments about its Clean Power Plan, which will put the first-ever national limits on the amount of climate pollution that can be emitted by power plants. EDF’s president, a senior attorney, and a clean energy specialist were among the hundreds of Americans who testified in support of the Plan. As these selections from EDF staff testimonies illustrate, the Plan offers moderate, flexible, and necessary measures to address climate change at the federal and state levels. It’s necessary: The climate is changing across the U.S.
“The stakes are high in Colorado as hotter temperatures, reduced winter snowpacks, and more frequent droughts are expected to decrease Colorado River streamflows. Our treasured Rocky Mountain ecosystems are especially susceptible to climate change impacts, and high elevations have already experienced temperature increases at rates three times the global average. Increased warming, drought, and insect outbreaks have increased wildfires and impacts to people and ecosystems throughout the West.” – Graham McCahan, a senior attorney with EDF’s U.S. Climate and Air legal team. “The Southeast is the region expected to be the most affected by increasing temperatures. Extremely hot days – 95°F or above – could cause a decrease in labor productivity by 3.2% in the construction, mining, utilities, transportation, and agricultural sectors. Extreme heat also is projected to cause 11,000 to 36,000 more deaths each year.” – Greg Andeck, EDF’s North Carolina senior manager, Clean Energy. “The bottom line is that we cannot continue down the path of unlimited pollution.” – Fred Krupp, EDF’s president. “Strong carbon pollution standards are consistent with a strong clean energy economy in Colorado. North Carolina’s solar industry is now ranked 4th in the country in installed solar capacity, thanks to policies that make it easier for investors to finance projects. North Carolina has more than 1,000 clean energy and energy efficiency companies that can help the state meet the Clean Power Plan. “We know that transition to clean energy is not only possible, it’s affordable. In fact, every time EPA has used the Clean Air Act to limit air pollution, it has ended up boosting our economy. Overall, the benefits have outweighed the costs by thirty to one. And every past rule has saved lives – tens of thousands of them. “For the millions of kids who will have fewer asthma attacks in the future. For the workers who will find jobs in new and growing industries. For the rate payers, who will see their electricity bills go down. For all of those who will be protected from the most damaging impacts of climate change. This entry was posted in Clean Energy, Clean Power Plan, Climate and tagged Clean Power Plan. Bookmark the permalink. Both comments and trackbacks are currently closed. Even if you took climate change out of the equation, there are good reasons for Americans to support the EPA so-called “clean power plan” such as the improvement in air and water quality and its associated health benefits. Yes, it’s going to hurt the American coal industry but that industry has been on a long, slow decline anyway and simply improving efficiency by 10% in coal-fired power plants (which is what the clean power plan is attempting to do) will not stop this slide.